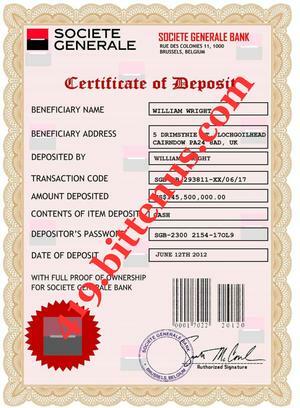 I already have in my possession the original copies of the certificate of deposit covering the funds, as well as the Death Certificate of the deceased, late Mr. William Wright. Attached herein are copies of the two documents mentioned above, for your perusal. 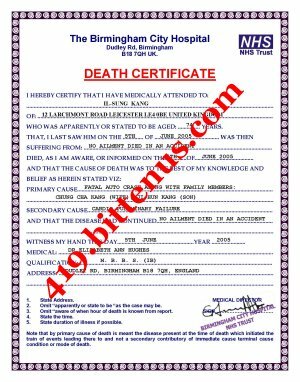 Like I said earlier, I will do all the inside job here, and the Attorney shall go to the court and pick up the sworn affidavit of claim, as well as the power of attorney which authorizes you as the Next of Kin and legal beneficiary to the $145.5 Million. I shall forward all the documents to you as soon as they are ready and you will present them to the bank. The bank shall release the money to you within 3 business days. It ' s not my wish that you spend even a cent of your own in this, but as a banker who does not earn so much, I do not have the resources to take care of this alone. I' ve spent nearly $6,400 for the documentation and to get us this far. Like I told you earlier, We need to work in an atmosphere of trust so that this venture can pull through. $145.5 Million is surely a lot of money and I believe this is God' s way to reward both of us, instead of letting the bank confiscate the funds or let it go into the hands of corrupt politicians. I have pledged to donate 30% of my own share to charity and invest the rest of the money in any lucrative business. Please try and get $1200 today and we shall be done. I promise you will never regret coming in contact with me. Our lives will change forever. I shall facilitate the whole thing from the inside here, therefore this shall go as easy as ABC. Afterwards, I shall give you the contact of the bank for you to contact the bank and make an official claim to the funds. I' ve already perfected most of the inside job here. Look, I' m not a greedy man, and I' m willing to share the money 50/50 with you so far that you can help me actualize this grand dream. See , when this deal finally pulls through we shall both be very rich, and we shall live the rest of our lives in wealth and affluent. Remember they say that Money rules the world. $145.5 Million is surely a lot of money. Like I said I believe this is God' s way to enrich us instead of letting the funds be pocketed by some corrupt politicians. I pray you succeed in raising the remaining amount needed to get this done. No effort you make in this venture that would be useless. My only concern is that you don' t betray me when the money is finally released to you. That is my only fear. I ' m counting on you to make this deal happen.